Trying to nail down the specific characteristics of different lighting types can be a sometimes difficult and confusing undertaking. Decades ago when incandescent lamps were the dominant type of lighting, choosing a lamp was not much harder than simply finding the wattage you needed. These days however, there are several lamp types available and each has become more commonplace as the incandescent bulb is slowly phased out due to its inefficiency. Fluorescent lighting is perhaps the second most recognized type of lighting as the growth of its popularity has remained fairly strong since its introduction as a more efficient alternative to the incandescent. With fluorescent lamps operating differently from incandescent bulbs, measuring output and making a decision based on lighting needs became somewhat more difficult since the overall light output of a fluorescent is not as closely tied to wattage as it is with an incandescent. These days, the waters are muddied even more by the introduction of the LED. LEDs produce light in yet another way, wholly different from either the fluorescent or the incandescent, and measuring light output or quality has little relevance to wattage at all with the LED. Complicating matters is the fact that it is not only overall brightness or efficiency that determines how suitable a lamp type will be for a given application. Different lamp types also produce light with different inherent qualities which affect how objects may appear when illuminated by them. For example, while a typical cool white fluorescent lamp will tend to make some colors appear quite bright, it may cause others to appear washed out, while a halogen lamp illuminating the same objects will cause all colors to appear dull with a yellowish tint. This is due to the differences in the color rendering properties of these light sources. Not to be confused with color temperature which simply denotes actual color of the light radiated as compared to a standardized light source, the color rendering of a lamp denotes its ability to accurately render the colors of objects it illuminates. The color rendering index is a scale devised some time ago to measure how colors may change in appearance when illuminated by a light source as compared to an accepted standard light source with the same color temperature. For example, a color chart with several different colors may be set up and illuminated with an incandescent lamp which is used as a standard reference. Then, the same color chart will be illuminated with a fluorescent lamp and any changes in how each of the colors appear are then noted as color shift. The differences in each color between the two lamps are compared and averaged, and the result then applied to the fluorescent as an indicator of its CRI. The CRI scale is maxed at 100, with this being the best achievable color rendering, and lesser numbers of 95 and lower being considered less effective. This is why you will notice many bulb manufacturers list CRI 90 or CRI 60 along with color temperature and lumen ratings. This is how the ability of the lamp to reproduce colors is represented to the consumer. In a nutshell, higher numbers mean better color rendering, and lower numbers represent poorer color rendering. It’s important to note, than when such a comparison is made in order to determine a lamps’ color rendering index, both the standard illuminator and the tested illuminator must have the same color temperature. This is because different lamp color temperatures can affect how we perceive a color, which in turn can taint measurement and cause inaccurate results. For example, if we were to consider sunset light and test that against our standard, we’d only get a CRI around 60. However, if we were to compare our standard against noonday light, we’d get a CRI of 100. This is due to the changes in color temperature of sunlight at different times. To further make things a bit more complicated, differences in color cannot be entirely based on the rated CRI of a lamp. For instance, an incandescent is considered a standard black body radiator, and thus is given a CRI of 100. However, we know that the actual color reproduction of an incandescent is poor at best because the incandescent is very uneven in spectral range and heavily skewed towards the red part of the light spectrum. A fluorescent lamp with a more even spectral range and higher color temperature, but a lower CRI, will still reproduce colors better than an incandescent. This is due to the fact that normal visible light is a combination of different light wavelengths, each representing a different color. Lamps the heavily skew towards one end of the light spectrum tend to reproduce colors outside that range poorly. For instance, if you were to illuminate a red apple with blue light, the apple would not appear red, but almost black, since no red light is being reflected from its surface. Hence, lamps which put out light covering a wider and more even breadth of the light spectrum will be capable of reproducing colors more accurately. It is at this point that things get difficult for LEDS. While other light sources such as incandescent bulbs and fluorescent tubes can be fairly effectively rated according to CRI and color temperature, this has been found to not be the case with LEDs. Because LEDs produce light in a manner unique from other light sources, they tend to be very monochromatic in their light output. This means that LEDs produce light which is sharply confined to specific regions of the light spectrum, and often deficient in other parts. Even illumination grade white LEDs exhibit this trait, which has led to some problems for lighting manufacturers in attempting to assign some sort of standardization to LED light qualities. While normally such spectral limitation would result in poor CRI, this is not normally the case with LEDs. A suggested reason for this is that because LEDs appear to improve the saturation of most colors, deficiencies in color reproduction are much less pronounced, and thus a more faithful reproduction of colors appears. 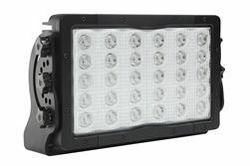 Coupled with the LEDs tight spectral range, this means that there is little color shift towards any specific part of the light spectrum while color saturation is high. Whatever the reason however, the CRI methodology is now being reconsidered by professional grading bodies and a new method for determining light quality being formulated although it will likely be years before anything simpler is devised.